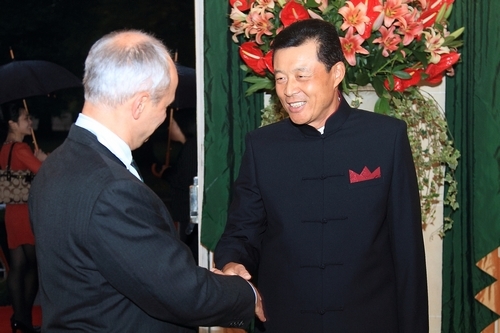 On the evening of September 27th, 2012, Chinese Ambassador Liu Xiaoming and Madame Hu Pinghua hosted at the Hyde Park Mandarin Oriental Hotel a reception marking the 63rd Anniversary of the Founding of the People's Republic of China. Commercial Secretary to the Treasury Lord James Sassoon and over 300 representatives from the political, military, economic, technological, cultural, educational and media communities in Britain, diplomatic officials in Britain and members of the Chinese community in Britain attended the reception. In his speech Ambassador Liu first looked back at the great achievements in the development of the People's Republic of China in the 63 years since its founding. He said that with the hard work of 1.3 billion people, profound changes have taken place in China. The changes are seen in China's economic development. China's GDP is growing by 9.9% on average over the years since the reform and opening up. This rapid growth for 30 consecutive years has created a "record of China" and a "miracle of the world". China has become the world's second largest economy and trading nation. The changes are seen in China's comprehensive progress. China not only takes economic development as the central task, but also promotes all-round progress in political, cultural and social fields. We take a people first approach and pursue a balanced and sustainable scientific development in all aspects. With this progress the Chinese society sparkles with unprecedented vitality and creativity. The changes are also seen in China's closer ties with the rest of the world. China opens to the world and seeks win-win cooperation. It takes an active part in international and regional affairs. As a responsible large developing country, China makes increasing contributions to the world peace and development. Ambassador Liu said that today, China is at an important juncture. On one hand, we inherit the splendid achievements of the reform and opening up. On the other hand, we also face the opportunities and challenges of a new period. China will speed up in reorienting its growth model. It will fully use the huge driving force and potential brought to economic development by industrialization, informatization, urbanization and agricultural modernization, and will achieve the goal of steady development. China will further intensify its reform efforts. It will unswervingly push forward the economic restructuring, and will also firmly promote the reforms in our political, social and cultural systems. China will adhere to open and peaceful development. It will pursue a peaceful development path to achieve the development in peace, by peace and for peace. China will pursue a more active strategy of opening up. It will be committed to expanding win-win cooperation with all other countries. When it came to the China-UK relations, Ambassador Liu positively commented the considerable progress in the bilateral relations during the past 40 years since the establishment of the ambassadorial diplomatic relations between the two countries. He said that the two countries keep promoting cooperation in various fields and have made fruitful achievements in all respects. The basis and ties of the bilateral relations are strengthening and the two peoples are building greater mutual understanding and friendship. Meanwhile Ambassador Liu pointed out that with the differences in history, culture, development stage and social system, China and Britain still disagree on some issues. To address the disagreements, we need to respect each other, seek common ground while reserving differences and avoid imposing our own views on others. We need to strengthen dialogue and communication, enhance mutual understanding and mutual trust and keep away from "microphone diplomacy". We also need to effectively control disagreements to prevent them from disturbing the overall development of our bilateral relations. Finally Ambassador Liu stressed that in the 21st century, both China and Britain are big countries with great influence in the world. The two countries should establish an active and healthy relationship. This means we should achieve mutual trust in politics, mutual benefit in economy and mutual learning in culture. The relations between the two countries relations should develop steadily and facilitate the comprehensive cooperation. 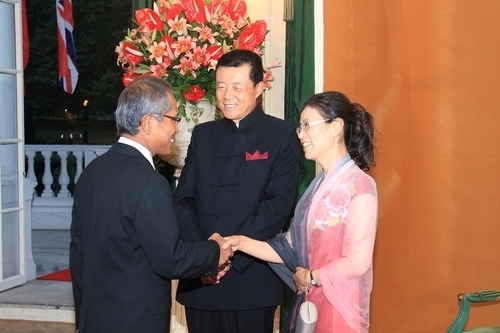 Ambassador Liu called for joint efforts to achieve the goal. 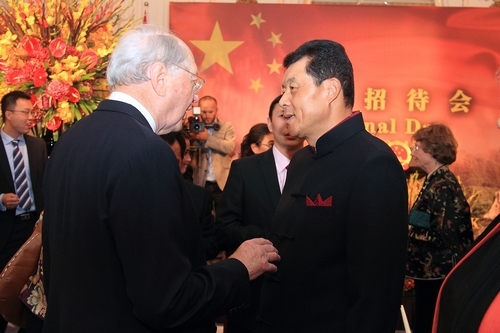 Lord Sassoon congratulated on China's 63rd anniversary and commended China's marvelous achievements in development. He spoke highly of the unprecedented depth and extensiveness of the bilateral ties in the past 40 years since the establishment of the full diplomatic relations between the UK and China. He said that the two countries should maintain communication and overcome the difficulties caused by the disagreements between them to seize the opportunity and promote the bilateral relations into a new stage of development. 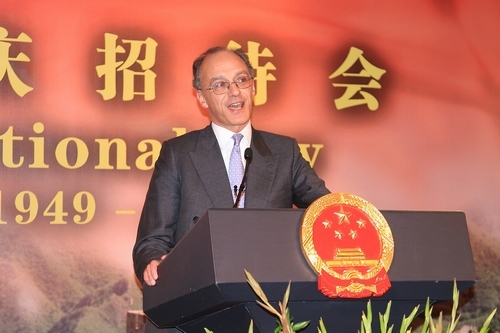 Lord Sassoon said that the trade between the UK and China is growing fast and is expected to reach 100 billion US dollars by 2015, achieving the target set by the leaders of the two countries. The UK has expertise in the service fields such as finance, insurance, health care and education and can contribute to the economic development of China. The huge opportunities and the open and stable environment for investment in the UK will create favorable conditions for the Chinese enterprises to enter the Western countries and open up global markets. Both Britain and China are committed to promoting trade liberalization, developing green technology and deepen cultural exchanges. The British government will make the greatest possible use of opportunities and work with the companies and all communities in Britain to jointly promote the development of the relations between the two countries. 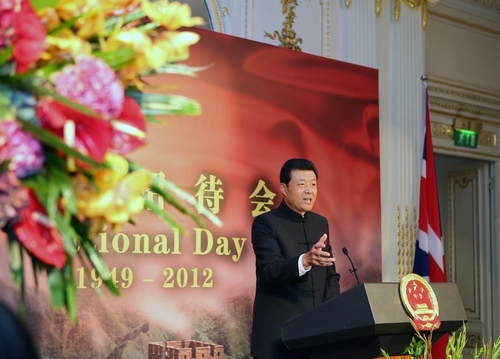 He wished China greater achievements in development and the China-UK relations a bright future. 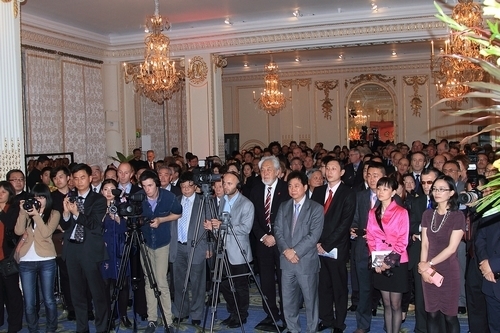 The guests responded to Ambassador Liu's speech with a warm applause. They congratulated on the 63rd National Day of China, expressed their admiration and appreciation on the tremendous achievements of China and the role China has played in international affairs, and wished China more prosperity. 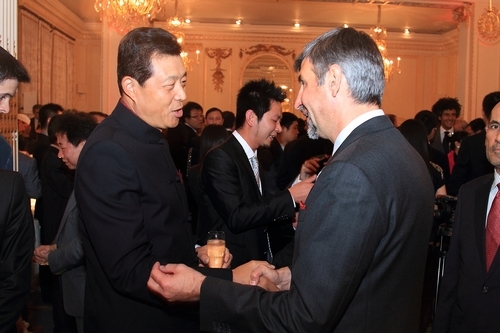 They said that Ambassador Liu's speech gave them a clearer picture on China's future development. They believed that China will keep making progress on the road of peaceful development, and that it will not only benefit the Chinese people, but also contribute more to the peace, stability and prosperity of the world. 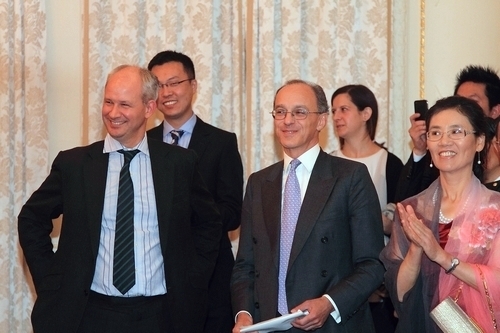 The guests thought that Ambassador Liu's open and fair insights in the China-UK relations are inspiring. They hoped that the bilateral relations would make new progress on the basis of mutual respect and equality, and said that the people from all walks of life are willing to make unremitting efforts to this end. The guests also visited with great interest the photo exhibition on the contemporary China organized by the Chinese Embassy.